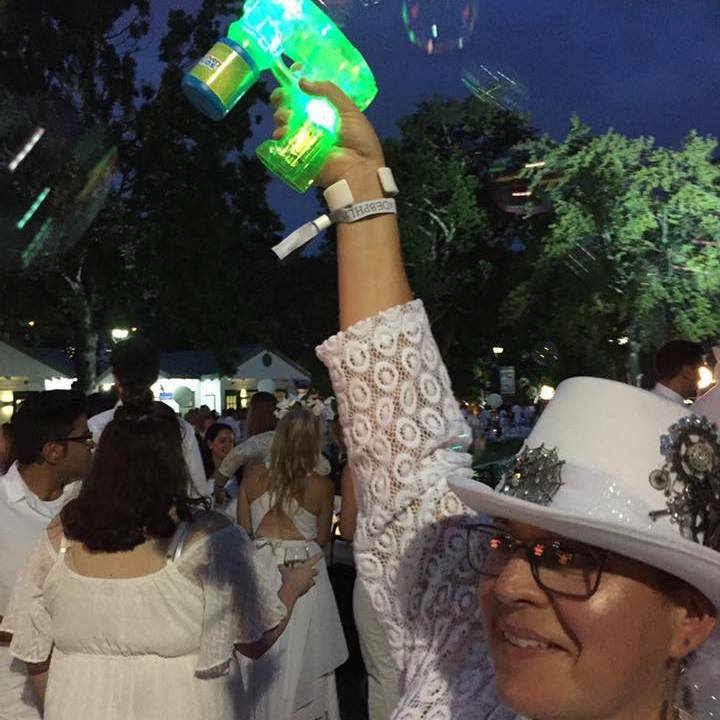 This year's Diner en Blanc 2017, was held on Thursday, August 17th. We were led from locations all from all over Center City, South Philadelphia and North Philadelphia, down to Franklin Square, which is located between 8th and 6th Streets at Race Street. Philadelphia's 6th year anniversary installment of the French Pop Up Picnic in White (the French version is going on it's 29th year now) was themed, Philadelphia First. Franklin Square was the perfect locale for the party - being one of the 5 original town squares of Philadelphia; the namesake of Benjamin Franklin; and a newly revitalized destination that is still over-looked and under-utilized by many Philadelphians. There couldn't be a better venue to bring attention to one of Philadelphia's hidden gems as well as provide the most elegant backdrop to what is arguably the biggest and best party of the year for Philadelphia. Diner en Blanc Philadelphia - #DEBPHL17 is also the largest one in the United States! I've been attending the party since the first year, back in 2012, when it was on Logan Square, and there were 1,200 attendees. I have been a table or pedestrian leader since 2014, when the party was on Broad Street, from City Hall down to Spruce Street. Of all the years that I've been a part of this event, this was THE BEST YEAR EVER! Last year at the Art Museum was a spectacular looking event. The backdrop of the museum, the views of the city, the fountains, City Hall, were unparalleled. The year the party was on Broad Street brought the party to the heart of the City. The first year, at Logan Square was magical and awe inspiring, making one feel as though we were all on the Champs de Lyse. Year 2 on the Bridge at 30th Street Station was lovely; Year 4 at The Navy Yard - well, let's just say the rain that night dampened spirits for most of the evening. But this night, this party at Franklin Square, with 5,300 people was intimate and interactive. It was magical. It was lovely. It was FUN. After last week's divisive and horrendous news, the malaise of the past 8 months has left me filled with ennui that I cannot shake. It's mostly the state of our country; the events in Charlotte; the politics; and the deaths of so many people in our lives over this past spring and summer. On the Tuesday before the party, I could barely pull myself off the couch. I knew on Wednesday night after work I had no choice but to go into full-on DO mode: gather and pack my gear; cook the food I was taking; make the cocktail I promised my gang; put together the goodie bags of candy and bubbles for all of my guests; get my outfit together. It was a night that had to be filled or else I wouldn't have been able to have a successful night out. I am a table leader after all and I promised my 50 guests a fun festive evening filled with bubbles and other surprises. I didn't' want to disappoint my people or myself for that matter! At our expected 5 o'clock meet up time, table/pedestrian leaders congregated at 6th and Market Streets. I wheeled my pack mule beach cart down to the corner where the Liberty Bell Pavilion is located, getting stares form tourists and people heading home from work. I looked like a fancy bag lady or street hawker selling my wares. After a few more of us turned up on the corner, people began asking us what was going on. It is very unusual to see throngs of people all dressed in the same colour of white, toting tables and chairs and other picnic paraphernalia. My guests and others were meeting us at 6:30. The 300 of us at this particular corner were told we were the last group to step off to the secret location at 7 pm, and I still didn't know where we were going! Around 6:30, I found out we were heading to Franklin Square, and that we were going to be lead by Historic Philadelphia's Drum and Fife Corp! Three or four men, dressed in historic colonial era garb along with a woman dressed in white holding a banner that said, Dinner en Blanc Philadelphia 2017, led us to the site with me being the first table leader to take EVERYONE to the site. I was in my glory. Thank goodness my outfit this year was the steampunk top hat I designed along with the long eyelet duster I wore. I was the Grand Marshall shepherding 300 people to the park, all marching behind the drum and fife corp with their music and my bubbles. I live for this! How thankful I am to the organizers, Natanya and Kayli for allowing me to be the leader of this group, making my dream come true to be out front and in charge! Once we marched to the site, my excitement didn't dissipate. We quickly set up our table row, decorated, put my bubble machine out (and found the perfect spot for it on a "shelf" on a wall that was next to us). We laid out our food and drink, sharing everything with ten or twelve people in our group. Of the 50 guests I led to the park, more than half were friends or acquaintances of mine. By the end of the night, everyone became friends. And this was the beauty of the night. People truly befriending one another. Loving on one another. Dancing, drinking, sharing and enjoying the experience of being together. As the evening moved on and we ate our dinner, it was time to walk around to experience the magic of the night. There was so much to do, so many things to see and try. Riding the carousel; playing mini golf; karaoke; playing on the swings and playground; heading over to the mobile cigar bar that was housed in an AirStream trailer; seeing other people's tables; stopping by the snack bar for cupcakes, cotton candy and other treats. The dancing, oh my goodness, the dancing! Two band and DJ stations. All the while I wandered around with my ubiquitous bubble gun, firing happiness all around me. Like on other occasions when I've had the bubble gun, it brings such joy to occasions, it's as if I'm throwing dollar bills at people, the reactions is such merriment. After our first round of checking out all that there was to do, and there was more than we saw and participated, we headed back to our table area for the 9:15 pm sparkler lighting. Our signal songs were the "Rocky" theme then we lit sparklers to ColdPlay's La Vida. To witness 5,300 people, all in awe of sparklers is to experience a truly enchanted moment. After sparklers, there was more drinking. I shared a peach-infused bourbon that I made. Hardly a drop was left by the end of the evening! Then it was back to the dance floors. At one end of Franklin Square, towards the 6th and Vine street side, a street drum corp came through rousing up the crowd. At the far end band stage, people were up on the stage dancing and loving on each other and being one intoxicated jubilant group of people. Black, white, men, women, people from all walks of life came together and were delighted to be in each other's company. It was on the dance floors that I felt the spell of Diner en Blanc's joyousness. I didn't think that this event could top last year's party. How wrong I was. The intimacy and communal experience brought people together and gave us a reprieve from the atrocities going on around us and in our lives. It's not that we want to or have forgotten what work needs to be done, it's that there are times when we need to blow off steam and remember to find the delight in the everyday. So much in the world today is troublesome. To find a moment of joy is a balm for our collective souls. For me, participating in a party like Diner en Blanc Philadelphia is my reprieve. I so admire your commitment to this event each year. Good for YOU! It looks fabulous and I'm sure I would enjoy it but, it seems like too much work for my taste. I love the pictures and Franklin Square was an excellent choice of venue! It is a lot of work, and at times, I wonder about my own commitment. the work leading up to it are a lot, and there can be some chaos and whatnot. But when you get there and see the entire event, well, it's just breath taking. I do love being a part of something larger than life and myself. Thanks for the comments and compliments! Fabulous - it looks like everyone had a terrific time.